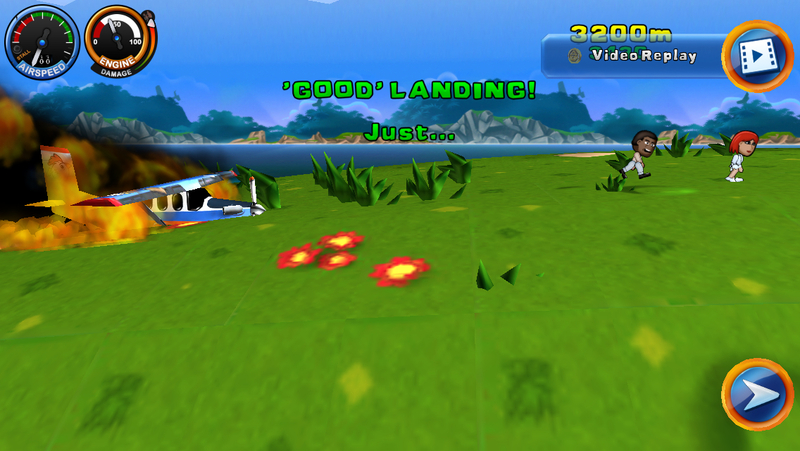 ‘Any Landing’ Review – Crash, Let’s Do It! Apart from fussing around with the odd flight simulator on my Commodore 64, one of the first flying games I remember spending any real amount of time on was Top Gun for the NES. Like many young boys, I thought planes were pretty cool, and I loved how I could choose which missiles I wanted to take with me. Anyway, this game was one of the ones that was kept at my grandmother’s house, so I only got to play it when we went there to visit, but I would almost always play it when we did. There was just one problem with Top Gun, especially if you only got to play it now and then, and if you’ve played it, you probably know what I’m talking about. 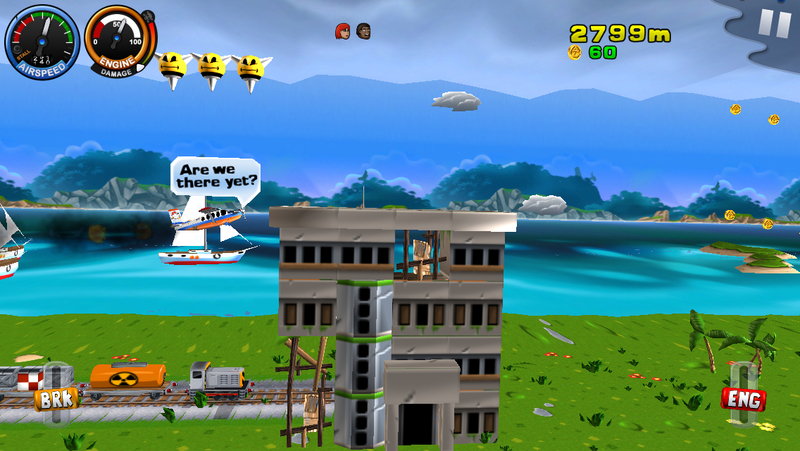 At the end of the first level, you’re directed to land your jet on an aircraft carrier. The game gives you all kinds of signals and directions that you’re supposed to follow, but no matter what I did, that plane crashed almost every single time. I think I landed it once, maybe twice? As a result of this game, I have a mild trauma when it comes to landing an aircraft in video games, but I have discovered some sweet therapy in the form of Any Landing (Free). Any Landing takes its name from the well-known expression that any landing you can walk away from is a good one. It’s something you’ll have to keep close to your heart as you play this game, because your plane starts off in bad condition and it can get a whole lot worse. It’s an odd little stage-based side-scrolling flying game where you have to try to keep your passengers happy, collect lots of different kinds of goodies, and most importantly, do it all while staying in one piece. It’s not so hard to do in the beginning, but the skies get more and more crowded as you go on, requiring some serious maneuvers if you don’t want a pleasant drop followed by a sudden stop. If you make a landing that doesn’t fit the definition of good we discussed earlier, it’s game over. As you fly, you’ll earn coins, which can be used to buy new planes. Wings are the premium currency of the game, and can be used the way premium currencies are in many games. 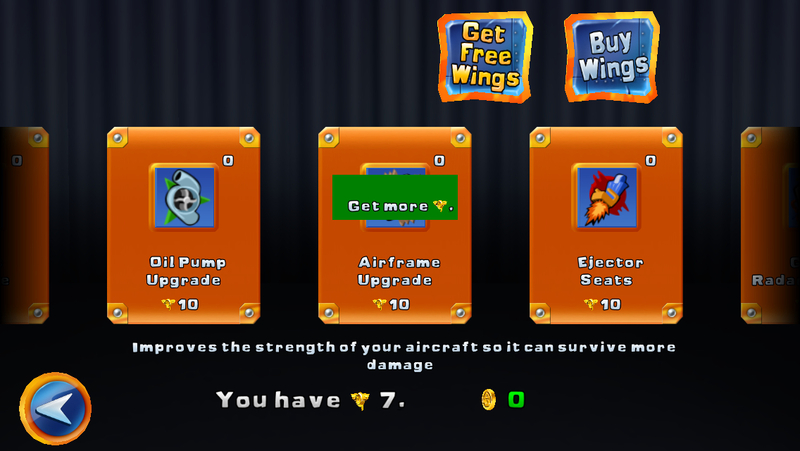 You can buy new planes with them, change them in for coins, use them to continue your game after a crash landing, buy power-ups and upgrades for your plane, and so on. If you crash land, your wings will persist into your next game, while you lose all of your coins. You’ll earn wings pretty regularly just by playing the game, for example by completing a passenger’s requests or simply scattered around the play area, but you can naturally buy them using IAP. The way Any Landing implements its IAP is both unique and commendable. You can buy unlimited wings for $9.99, effectively unlocking the whole game in one fell swoop, or you can buy smaller packages of wings for a dollar or three. The interesting thing is, if you buy one of those smaller packs, it applies a discount to the unlimited pack, effectively putting a $10 ceiling on how much you can spend on this game. That’s a pretty generous way to go about things, and it means you can spend a buck on some extra wings, not having to immediately commit to the more expensive unlock while simultaneously taking comfort in the knowledge that you haven’t wasted your money if you do. As for the game itself, as long as you don’t mind tilt controls, it’s quite fun. You have two virtual buttons to control your acceleration and braking, and tilting left and right will cause the plane to climb or descend. If you climb too quickly, your engine will stall, sending you into a speedy trip downwards. Likewise, descending too quickly can lead to nasty accidents. Accelerating wears down your engine, and running into objects causes structural damage to your plane, but both can be recovered via mid-air power-ups or landing at an airport. There are all kinds of things strewn about the levels, including simple obstacle type enemies, more aggressive ones that will take shots at you, buildings you can crash into for extra money, mid-air cargo that sometimes contains useful power-ups you can either use or bank for another run, and kittens. Landing is pretty easy and can be done almost anywhere, including the roads or on top of a train. Just make sure you level out, slow down, and aren’t headed for any walls. The gameplay is delivered with a theme that has its tongue planted so firmly in its cheek it threatens to burst through. Lots of silly voices and sound effects accompany the mayhem, and visual gags abound, such as the fact that when you start the game, half the time your plane is smoking or on fire already. Even the Game Center achievements are a bit goofy. Even in darker levels, the atmosphere is light and cheerful, and crashing your plane just elicits a simple “oh dear" from your little pilot. The message is clear: don’t take it too seriously, just have fun flying, crashing, and landing your planes. I wish the rest of the game’s messages were so clear, though. It’s really hard to figure out how this game works, what things do, and so on. There’s a tutorial that teaches you things you probably could have figured out on your own, but if you want to know what a power-up you picked up does, you’ll have to go into the menu to buy it and read the explanation there. Even the overall goal of the game is confusing at first. I didn’t realize what I was supposed to be doing until I played a few games and cleared a few levels, and the game wasn’t in a hurry to tell me anything beyond making money. What do the cats do? Where and why should I be landing my plane? What should I be trying to hit and what should I be trying to avoid? All of this has to be discovered through trial and error. I’m not one of those people that needs a 50 page manual for every game I play, but this game could really use more instructions. It could also do with a heaping helping of bug fixes. While playing the game for this review, I suffered crashes (of the game, not the plane), but more strangely, sometimes the game would just roll back for unknown reasons. I’d get a game over, go to restart, and find myself at a point halfway through a run I did earlier. My wings were still the way they should be, but everything else was weird. I’m pretty sure the game only makes checkpoints every four levels, so this behavior is very mysterious to me. Maybe it’s another unexplained feature, I can’t be sure. In addition, sometimes the gyro would reverse on me, leading to left and right switching between climbing and descending between landings and take-offs. This generally resulted in a crash landing and a game over, which was perplexing and kind of annoying. Any Landing is a fun and unique game, and I again want to applaud the developer for their very customer-friendly approach to IAP. The game itself is quite playable even if you don’t buy any IAP thanks to how generous it is with its premium currency, and the sense of humor is certainly welcome. It feels like it needs a few refinements to really find its footing, but there’s no harm in trying it out for free in the meantime. You might have turbulent first impressions of the game, but if you stick with it long enough to get it, you’ll probably have a good time with it. Plenty of people in our forums have enjoyed Any Landing, too, so be sure to check the thread out for more impressions and comments from the developer.